My time here in Leeds has been off to a great start. I’ve met some really nice people from all over the world in my residence hall. I now have friends from France, Sweden, Germany, Greece, Spain, Australia, and New Zealand! We have had fun comparing similarities and differences between our countries. We’ve also been able to laugh about the state of our residence hall. Like most dorms at Madison, our residence isn’t equipped with the most modern and up to date furnishings. We have all joked about the state of our ovens, beds, etc. The conversation that made us laugh the most was about our confusions regarding our bathrooms when we first arrived. 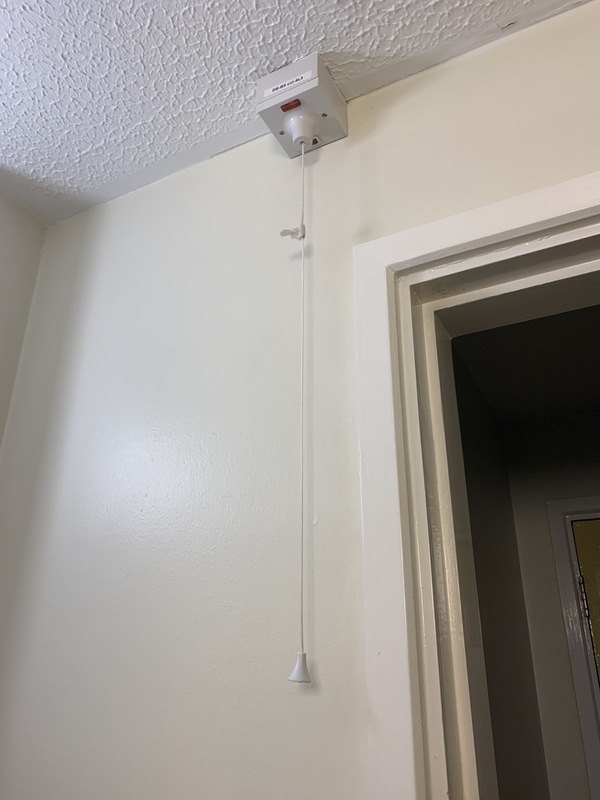 My confusion about my bathroom started when I first got to my dorm and I saw a string hanging from the ceiling in my bathroom. I thought it could potentially be the light switch, so I gave it a light tug. Nothing happened and the lights stayed off. I gave it another tug, this time harder. Again, nothing happened. So, I thought to my jet-lagged self, “My lights are broken. I’ll have to submit a maintenance request and have someone come fix that for me.” For the rest of the day I used the flashlight on my phone for my light source whenever I needed to go in the bathroom. The infamous string hanging from the bathroom ceiling. Since I finally had my lights working, I went to go shower. In the shower, there is a power button on the temperature control device rather than a handle. I think that the button is to turn on the water heater in the device, so warm water comes out. So, when you hit the button, water should start to come out of the shower head. That was not the case for me. I hit the button and no water came out. I didn’t know what to do because I needed to shower, but it wasn’t working. 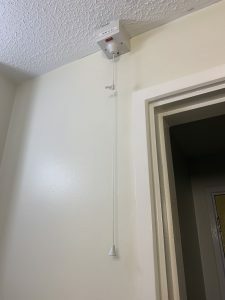 I got out of the shower and I thought that I would just try pulling on the string from the ceiling one more time, because there has to be a reason that it is there. When I pulled on the string, thankfully, I heard the water start running in my shower. After all of this, I was a little embarrassed with myself because bathrooms are not complicated (except for this one). Then one night, I was hanging with some of my friends from my residence hall and the topic of the bathrooms got brought up. Everyone was just as confused as me about the string hanging down from the ceiling. One girl had to use her neighbor’s shower because she thought hers was broken. While, one boy went to his neighbor’s shower to ask him how he turned it on, only to find out that he had a completely different shower setup. We all laughed so hard as each of us shared our stories about the bathrooms. Part of the fun of the dorms, especially when they’re not totally up to date, is that there is a mutual experience between everyone. We can all laugh together when things are not perfect, especially when it is about a bathroom, because when you go abroad, the last thing that you think will give you problems is the bathroom. And, now that I understand how to use my spaceship, I mean bathroom, it has been really nice having my own. I don’t have to worry about if a shower will be available for me to use when I want or if other people will leave a mess near the sink. Plus, I now have a funny story about the time I felt I needed instructions to use a bathroom.